Surgery Theater is an online medical publishing company and the world's first video and document sharing educational portal for ALL surgical procedures. Our goal is simple: by creating an open source platform we want to index every surgical procedure from A to Z. We believe that global healthcare problems can only be overcome when education is the integral part of the solution. With the understanding that collective knowledge is the ultimate pathway to progress, we have created this portal to overcome many obstacles which existed before. Whether you are a student of medicine looking to learn new procedures, a patient wanting to know more about a procedure you are having, or an innovative surgeon with new surgical techniques to teach, feel free to browse, learn, share and grow. How can I sign up on Surgery Theater? On the top right corner of the page you will find Sign Up. 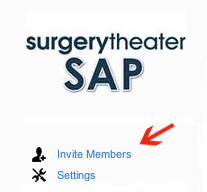 Click here, fill in the required fields and you will have a profile on Surgery Theater. Here is a direct link to the sign up page. Why should I sign up with Surgery Theater? Once you have created a profile you have the ability to participate in the Surgery Theater community. You may now upload videos, images, lectures, and documents, post questions, create groups, find contacts and a multitude of other functions Surgery Theater provides you. By signing up, you are taking the first step toward contributing to medical progress and education! What does it cost to use Surgery Theater? Nothing. Nada. Zippo. Surgery Theater is a free online service created for the medical field by the medical field. If you hover on your username on the top right corner of the screen you will find a drop down menu. Click on My Profile to get to your profile page. If you hover on your username on the top right corner of the screen you will find a drop down menu. Click on Account Settings and then click on Manage Account on the left menu. After you have gone to “My Profile” look at the bar on the left of your page. Directly under About you will find edit it. You can add/remove/modify your profile picture, practice or university information and other general information. After you have logged into your account you can upload any video, audio file, photo or document by hovering your cursor on the Upload button on the top bar. Click on the appropriate button depending on what type of file you would like to upload. Fill in the form providing the file’s title, description and enter tags so users can easily browse for it. Then browse your computer for the file and begin the upload. what type of content can I upload? You can upload only surgery, lecture or medical instructional videos, photos, audios, and documents. All the content has to be related to surgery or medical education. Any commercial material or advertising content uploaded will be deleted from the system. 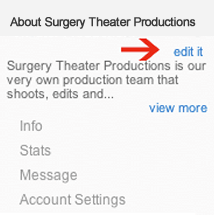 Feel free to browse Surgery Theater's library to learn more about the type of content we allow. What format does my content need to be in and what is the maximum size? Files may not exceed 400 MB. How can I remove my content from Surgery Theater? Go to My Profile. On the top bar click on the type of media the content that you want to delete is. You will find a bar that looks like this (featured below) along side each piece of media. Click on Delete to remove the content from Surgery Theater’s database. How do I modify or edit my content on Surgery Theater? Go to My Profile. On the top bar click on the type of media the content that you want to delete is. You will find a bar that looks like this (featured below) along side each piece of media. Click on Edit to make changes to your media. How can I add a comment to someone’s media? Under each video/photo/document/audio you will find this display. In order to post a comment, simply write in the box that says Respond to this video and then click on Post Comment to make your comment live. You must be logged in to comment on any item on the website. How can I rate media on Surgery Theater? On the right side below your media you will find Rating and 5 stars. Hover your mouse over the desired star rating and click on the amount of stars you believe the video deserves. Here is how the star rating system works. You may not rate your own media. If you believe an item of media is in violation or abuse of the Terms and Use and is inappropriate for Surgery Theater please click the little flag icon shown in the picture below. You will find this icon below the media and above the comment box. After you have clicked on My Profile, look at the bar on the left. 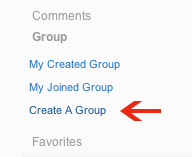 Under About you will find Group, click on Group and then click on Create A Group from the drop down menu. Fill in the required information and then click submit to create your group. Once you have created the group as a group moderator, you will find Invite Members located under your group’s picture icon on the top left side.